From the beginning in 1995 with a few furs up to the biggest furry convention outsie the USA today, Eurofurence keeps growing every year so the workload to carry out Eurofurence grows every year. Some of the work is visible for attendees and some is not. So we think the time has come to give you all a deeper view into the work of the fuzzys in the Eurofurence team. Therefore every Monday one department will give a self-introduction: we present the "Introduction Monday". We are always looking for people who are either native to the English language (AE) or very fluent at it to help proofreading the Conbook. Usually proofreading starts in the last week of July. Depending on how quick you are at reading and evaluating mistakes you should plan in at least an hour or two. The Dealers' Den provides a point-of-sale for artists and dealer who are offering all kind of furry related merchandise. Artists for example offer their services with sketches, con badges, little drawings or full coloured artwork, they sell high quality prints, self published comic books and all kind of little things with their art and handwriting on in. Some artists specialized on sewing and costume building offer pre-made costume parts, self made plushies and display their portfolio for commissions later on. Dealer and merchants offer a wide variety of either self made or designed goods like t-shirts, leather crafting, soaps, sweet treats and liqueur, or offer books and plushies from lager brands. The Dealers' Den team itself runs the Eurofurence Shop on site which offers all the leftovers earlier Eurofurences, mostly t-shirts. The Dealers' Den also maintain the Artist Alley - a point of sale in the public area where mainly artists have the opportunity to sit down and offer their skills in a more flexible way. Since there is no registration needed the Alley is meant to be an area where artists and customers get together spontaneously - first come, first serve. The Dealers' Den Team make sure that everything from preparations and registration for the Den, the seating situation, the point of sales itself (including set up and break down of tables and power sockets) work out smoothly for the artists, dealer and customers. We are also the contact persons for the artists and dealer during the convention to all kind of departments like Con Ops and Security if there might be any problems need to be solved. We also host all kind of minor services like a pc with scanner or a get together party for artists, dealer and staff members together with the Art Show Team. At the moment the Dealers' Den team is not looking for help, but times are changing, especially at the convention, so don't hesitate to ask if they need help. The required time depends on the job you have within the team - most of the work has to be done in advance, like registration forms, seating plans, e-mails, artwork for conbook and door signs, handouts etc. On site it is about two hours of set up on Wednesday and three for the cleaning on Sunday, or additional Thursday, Friday and Saturday from 11am to 7pm within the Den in the Eurofurence Shop. The Daily Eurofurence is a printed newspaper covering events and stories about Eurofurence and the fandom in general. Four issues of the Daily (with four pages each) are printed during the convention, from Thursday to Sunday. We are a team of about a dozen writers, photographers, layouters and cartoonists. Our goal is to both inform and entertain our readers. Our mission is to go to the most exciting events, talk to the most interesting people and ask the most pressing questions. Also, our best photos since Eurofurence 15 are collected in a permanent archive as a part of Eurofurence's "visual memory". Daily contributors get to meet inspiring people and they get a glimpse behind the scenes of Europe's biggest furry convention. If you are interested in helping, or if you have ideas for articles, please contact our director Luxen. We are always looking for writers, editors and photographers. From our team members we expect daily contributions (at least one article or photo job a day) and attendance of our morning meetings. Please be aware that most of the work (writing, editing and processing images) takes place in the evenings. The workload varies between two and six hours a day, but we promise to do our best to make sure that you can still enjoy the convention and that you don't miss your favourite events. We offer a friendly work atmosphere and good learning opportunities for both writers and photographers. Sounds good? Contact us (luxen@furry.ch or @eartufts on Twitter/Telegram) or simply visit our Daily EF office during the convention. A lot of hard-working, dedicated people make Eurofurence what it is: a great event full of creativity, color, fur, stage shows and inpromptu-fursuit artists. Behind the scenes, this requires a lot of planning, preparation, coordination and general "making the magic work". Thus there's barely a spot where IT systems don't play a role in the background. While, traditionally, each department builds and operates their own system tailored to their specific needs, more structure and knowledge has become vital over the years. The Eurofurence IT department fills this role of a central coordinator and service team for every department that needs IT services before, during or after EF. Among those are the operation of the EF server, which hosts our website including the Daily EF archives, forums, a multitude of internal systems like wiki, etherpad, kanboard, otrs and so on. We help coordinate the main registration system for EF, for fursuit badges, art show and dealers den. New systems are installed or custom-crafted for special purposes, like an electronic "stage rider" for stage events. On-site we coordinate with the Estrel IT to get the internet connectivity working; for instance, this included last year's live-stream of our "big party" to the outside, running the IT infrastructure like DHCP/DNS, provide hardware (PCs, scanners, switches, etc.) for departments which don't have their own and run our staff wifi. The most visible part for attendees is our very own "Eurofurence app". It's completely custom-built by us, with a high-performance cloud backend and native on iOS, Android and even Windows Phone. Close cooperation between departments is needed here to get all information from event programming, dealers en listings, general information and more into the app. Since our work is so specialized and diverse, we don't usually have open job postings. However, if you're good at IT maintenance, administration and especially programming and would like to help primarly outside the actual convention days, feel free to contact Zefiro. You might soon become part of a ninja team dedicated to keep things running. Our departments responsibilities include everything from the discussion of suitable guest of honor candidates to taking care of our guests at the convention itself. However most of our tasks have been taken care of month before the convention starts. After introducing Eurofurence to our potential guest, inviting them, and in best case, getting a positive response, rooms and flights need to be booked, events need to planed … all this requires a lot of communication and cooperation with the other departments. In fact, we need to thank all the other departments a lot at this point. Their hard work and dedication makes our job even possible in the first place. After the convention is before the convention. Being a staff member means for me that, when the mere endless wait for next year’s Eurofurence starts and the PCD hits hard, there is still a bit of Eurofurence going on each week. Weather the regular group chats with the other departments, looking for fitting guests, writing invitations or planning ahead our guests events - it all elevates my mood and never feels like a chore. Having contact with all these creative, nice and amazing people throughout the process is something we would never want to miss. Another great motivation is to get a look behind the scenes. Seeing how the next Eurofurence takes shape, how much work, how many hours of planning and how much creativity is put into everything is a great experience. We are still taking so many things for granted, only to discover later the enormous amount of effort it took to make it run so smoothly. Another enormous motivator is the pride that derives from playing a small role in making the Eurofurence what it is. Plus, the greatest thing of all is, after greeting a guest arriving at the Estrel, days later at the departure we very often get to say goodbye to a new friend. Historically, the Daily-EF has their own photographers as well as several department internal photography that might be required. Our responsibilities are directly connected with the convention attendees and involve post-processing of the images we take after EF is over. Thus - by definition - pictures that are needed during the convention are not part of our responsibilities. Our department consists of photographers and assistants. Share some hours per day on the photo shoot location, using rented equipment. Help some hours per day on the photo shoot location. This involves handling props, fursuiters and/or operating the registration system computer on location. There will be two assistants in parallel. If needed, help the photographers at other locations by holding up props, directing people or carrying equipment. Both duties involve keeping to a schedule that will be discussed and up for fine tuning within the team as soon as the EF timetable is available, so usually nobody has to miss out on "must go" events. The fursuit photo shoot might be amongst the more stressful tasks that EF has to offer, but the chance to meet lots of suiters up close and personal makes for a good reward. Also, we try to minimize the hours per day by using enough people to divide the workload. If you are interested in helping out, contact Atkelar or ShortyDragon, using photo@eurofurence.org before the convention. We might need a few helping hands during setup and tear down of the photo shoot location and the group photo spot that are able to carry some delicate equipment when directed to do so. 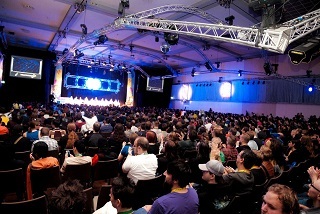 The gameshow department is responsible for planning and operating the fursuit gameshow at EF. This involves finding new and revamped games for the suiters to play, building props, testing the games, communicating with the involved departments (programming, stage, security) to get all the locations and timeslots sorted out. The main idea is to add the "show" to the "games". Most conventions only are doing "fursuit games", which is fun but usually only mildly entertaining to watch. We strive to add some interesting aspects to all games that we are putting on stage. The best ideas however sometimes fail in reality, even after trying them out several times. The show is a "one-off" kind of a deal, so we always expect some "issues" which require fast troubleshooting capabilities. We are usually looking for helpers in the backstage area: moving props on and off stage, getting fursuiters ready for their cue and sometimes helping during a game - as spotters and/or "living props", depending on the game. We are planning everything out way before the convention and need helpers who will be available online at least some weeks before EF so we can go through the show and games and everybody knows the props, games and can start to learn their cues. We don't get rehearsal time at EF! 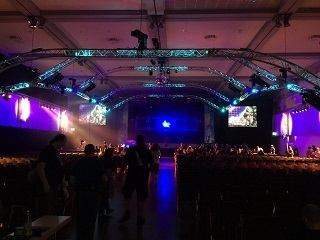 Every year, the stage team comes up with a new design for all bigger stages at the Eurofurence, like the main- and club stage. Our mission is to plan, build and operate all Eurofurence stages. Involved in this process are many people and when everything works well you might hardly notice them at all. As soon as one EF is over, the planning for next one already started. With an after con meeting at the last day we try to improve our work every year. During stage team meetings throughout the year we come up with new ideas and concepts that fit the theme of the upcoming EF. Exchanging knowledge and ideas is vital for this. Assigning tasks and making time schedules is also done during stage meetings. Operator, Programmer, Event Manager, Stage Manager and Backstage Manager are some of the roles that need to be staffed for every event. 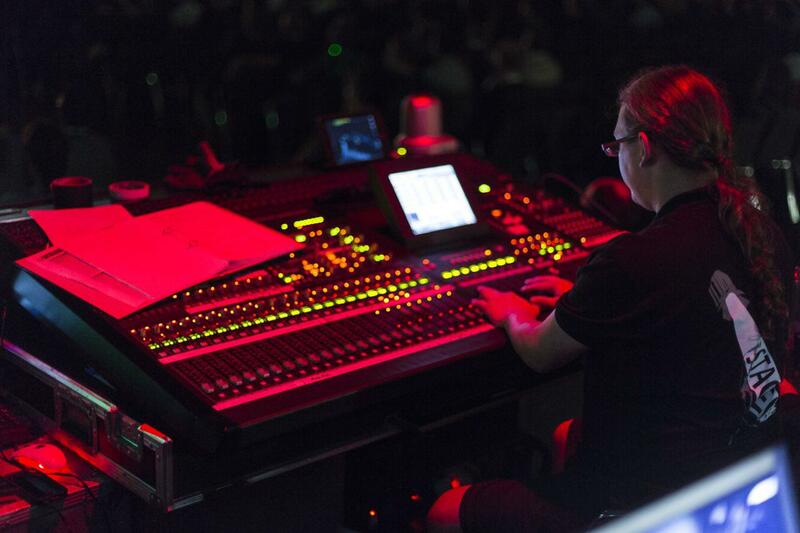 You don’t need to have knowledge about stage work to be a part of the stage team, as long as you are eager to learn and get excited about event technology. You do? - Than you are a good fit to work with us. 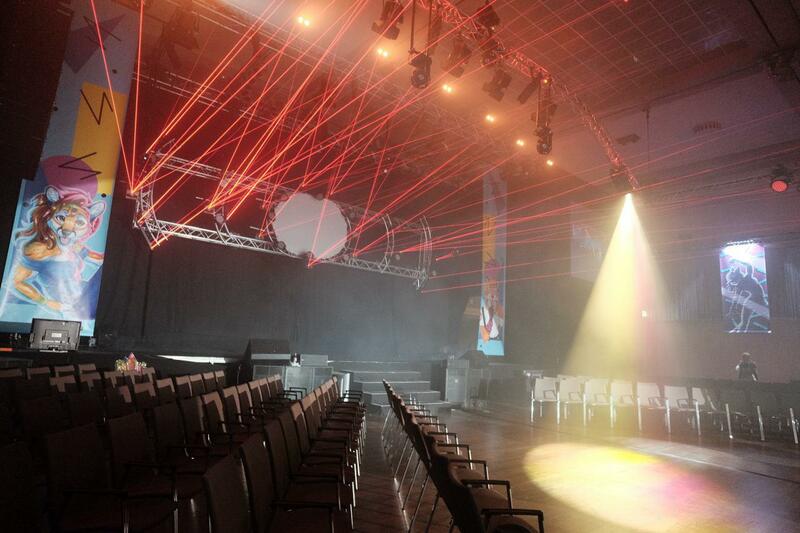 Most of the stage equipment is supplied by a professional rental company, which we work together for several years. The Main Stage is setup by the rental company. As soon as the setup is finished, our work starts. 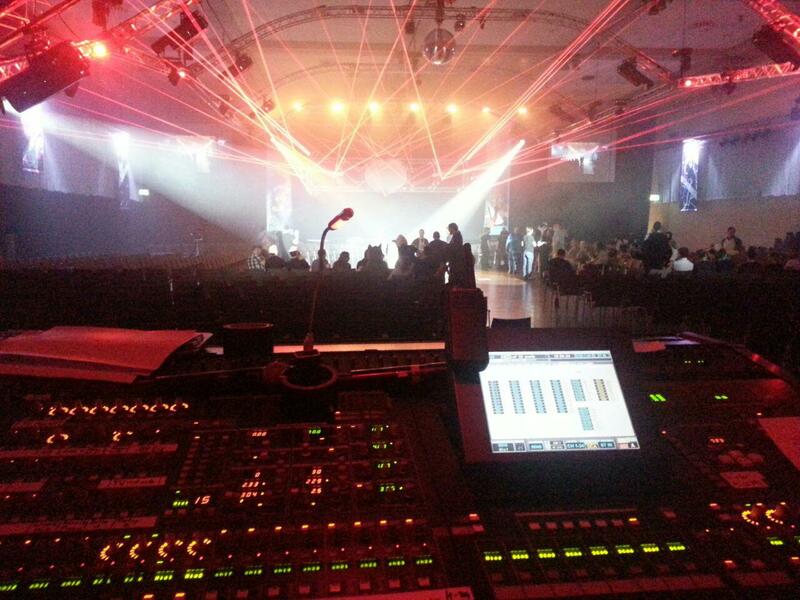 Programming of light-, laser- and sound-consoles is done by senior team members who are specialized in their departments or work as event technicians. They are assisted and operated by those who want to gather deeper knowledge in the particular field of work. 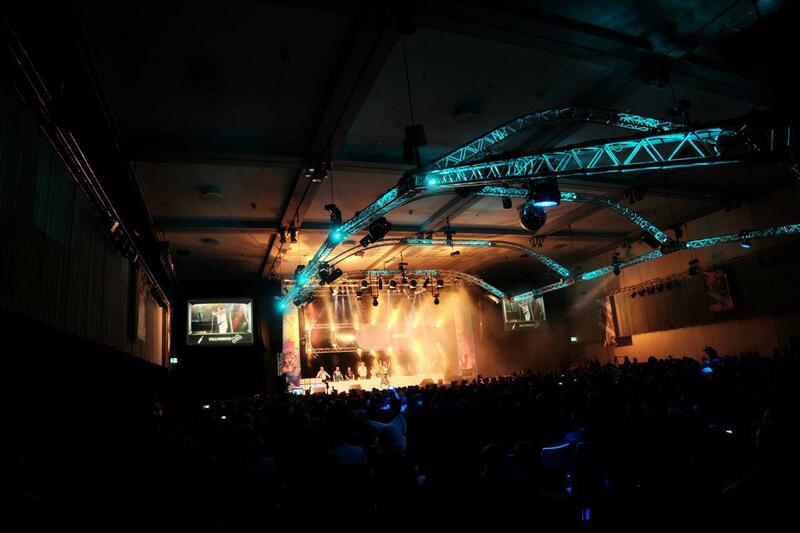 At Eurofurence, we host a wide spectrum of stage events. From game-shows to concerts to dances and the well-known Pawpet-Show: Everything is possible and assisted by the stages team. We connect the artists with technology so they can deliver the best performance possible. Sound good? Want to become a part of the team? 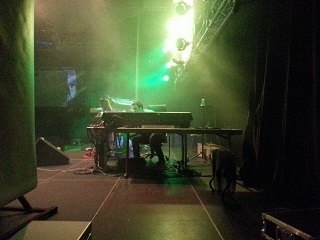 The contact garra via stage@eurofurence.org or visit the Main Stage during the Eurofurence and talk to us. Programming at Eurofurence is primarily about putting together the convention schedule. What sounds easy at first gets more interesting and complex if you understand that it's about coordinating the departments of Eurofurence and attendee panels with their indivial timetables and requirements for ressources and rooms. That means over 500 hours of scheduled event time in up to 18 parallel events distributed over the whole convention space, and the numbers growing! While planning this, it's important to take into account what kind of events are running in parrallel and allow enough time before and after them. Keeping an eye on the available ressources like sound systems and projectors or even people able to operate them add up to it. Most of our work is done the moment the con starts, but to guarantee a smooth con experience we work closely with Con-Ops and Security while the convention is running. On-site programming is keeping track of the schedule and re-schedules time or location if nessessary. We try our best to keep the attendees informed of possible changes and delays by announceing these via our screens, twitter, telegram and the ef-app. To archive that we constantly check back with the other departments too. We also use these channels to pass news from our departments to our attendees. Communication is a key. Not only internal, but primarly with interested parties outside. The job demands an organisational talent with an eye for details without loosing track of the big picture. Convention Operations (ConOps) with its 20+ voluntary helpers are one of the first teams arriving on the convention venue. A lot of Material and Equipment must be in the right place long before even the first guest arrives at the hotel. During the convention, our guests can interact with ConOps personally through the Locker-Service (managed by the security team in the previous years) for storage of valuable luggage or the front office which will be at your Service for any requests or problems you might encounter. Behind the scenes, we still manage several tasks. We prepare events and panels, setup and breakdown of equipment, transport and acquire additional materials and much more. After the convention is officially over we are still hard at work. After deconstruction and evaluation, we start planning for the next Eurofurence and react on general requests of attendees throughout the whole year. 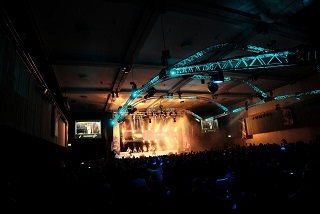 So, with us you will gain an exceptionally sight behind the scenes and structures of Eurofurence. We are involved nearly everywhere and help wherever we can. Our motivation is sourced in our excitement in helping others. We enable and relieve others. Our will to help each other is the base of our doings and our passion for EF drives us forwards. Setup and breakdown: This Team needs to be available bevor and after the official part of the convention and it is responsible for the transportation of our equipment. New members would need to arrive earlier and/or departure later. If you have any experience in logistics it would be appreciated but it’s not mandatory. It is quite possible that you would need to spend a significant amount of time on this task but only before or after the official part of the convention. On-demand crew: This crew is a quick response team for unforeseen additional tasks during the convention. Additionally, to your will on helping us you would only need the Telegram app on your phone. The time you will spend on these tasks is limited to the tasks you respond to. If you can’t respond to every request that’s no problem. Room management: This team prepares panel rooms following the event schedule. Different equipment has to be transported to or fetched from the panel rooms. You need to be reliable and on time to prevent any delays in the schedules. Therefor you will work with others in time slot separated schedule. During the convention days, this will take 1-2 hours of your time every day. Front office: In the front office you have to respond to questions or inquiries of our guests. Therefor you will need to speak English quite fluently. Also, you need to be calm, professional and friendly all the time. The front office team is organized by a schedule that is divided in 2h time slots. You will spend approximately 2 hours a day in the office when you join us, limited to the main con days of course. Locker-Service: The Locker Service allows our guests to leave their luggage in our hands and we will take good care of it. We are currently transferring this service from the security team to con ops, and are therefore looking to expand our staff to cover our new responsibility. You have to handle these bags, trunks, cameras or cases with great care and reliable. It would be appreciated if you will be able to speak to your customers in English and additional languages. The locker Service is available during its opening hours and during these you will need to spend approximately 1-2 hours a day of your time. If you want to join several teams please contact us and we will do our best to find a solution that suits your expectations. Starting at Eurofurence 6 in the year 2000, a small number of people gathered to create a skit and playback based one hour show inspired by the puppet shows at US Furry conventions. Originally planned as a one-shot event the production was well-received by the audience, so the team decided to continue and experiment with the idea. Adding characters and storyline the show evolved into one of the larger stage events at Eurofurence. In the beginning it was just a handful of people, today we are a group of more than 30 volunteers working together to create a story-based, drama/action/comedy filled show for mature audiences. Resembling a makers workshop we use our different skills to create puppets, backgrounds, props, special effects, music, script and so on to make this production become reality. Contrary to our beginnings, all of our puppets on stage nowadays are built by our puppet creators, making each of them unique. We share the passion for theatrical productions and some of our goals include a good storyline, convincing characters and situations that astonish the audience. When the convention is over, all is packed up and stored and many exhausted departments go into a deep, dreamless slumber for many months to come, that's when the Eurofurence website team powers up to full throttle. Our mission sounds as simple as it will ever get: make a website, and make it good - the way, however, holds a lot of time-consuming tasks. Over the course of only six months, our team of specialized designers, artists, writers and programmers conjure a design based on the next con's theme and anchored so deeply that even function follows design, appoint an artist and creates the annual, stunning art piece that is first to introduce the topic to public and staff alike, updates and layouts all content and molds everything into code that will not only follow the newest standards, but will also run on all combinations of screens, desktops, phones, operating systems, browsers and configuration possible. Our job doesn’t end with a static website, too. As the front face of our convention, we also respond on social media, provide an entry-point for all support questions and operate as an interface between our guests, staff, reporters and anyone else interested. We keep all threads together and know our way around. There's no department we don't communicate with and no question we can't answer. Our very few, focused team members don't just do one job. They're all-rounders, and no less is required. Finding new members is respectively hard for us. We're almost always under numbered and welcome skilled designers and web programmers with open arms. If you consider yourself remotely suitable for either of those two positions and would like to join our squad or take a closer peek into how we work, by all means feel encouraged to give us a shout. Regardless of whether you're a designer or a programmer, you should know your way around HTML and CSS3 (more so if you're applying as a programmer), you should be able to communicate in English or at least German, and you should be motivated be available all year long, with work density peaking up between August and January. Of course, we're all humans and have our own jobs, lives and vacation. Doability has been tested more thoroughly than any responsive design we've ever worked on. 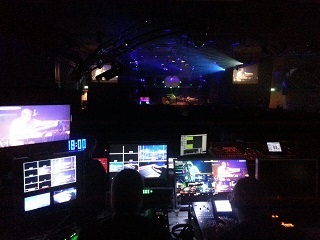 The Videoteam at Eurofurence is responsible for the live broadcast and recording of events at the con. We produce the official con highlights video. Our work begins 3 months before the con with aquiring materials for broadcast, planning, testing and scheduling, and end two months after the con with the release of the highlights video. During events on the main stage, three cameramen, a live editor and a remote operator work closely together to create a live feed for the big projection screens so even the people in the back rows can see what is happening on the stage, even if it’s just monitoring how much wine is left in Uncle Kage’s bottle - we will make it visible for you. For this, we operate professional grade HD studio cameras as well as remote controlled ceiling cameras (So-called PTZ cameras) or even GoPro cameras. Didn’t make it down to the stage in time for the event? Worry not, stay in your room and watch the event on your TV. We also broadcast stage events to the hotel TVs on our very own TV station, EF Prime. You can find us on Channel 1. And when there are no stage events going in, tune in anyway. We provide you with fun and entertainment 24/7 during the con. Another of our tasks is to collect footage from all corners of the con and we mean it. Look under your seat, look above you, one of our cameras may be there. After the convention, we get busy producing the convention highlights video that will be free to download for everyone. If you have ever been to a furry convention, you will have likely found yourself surrounded by cute fursuiters posing for photos and offering hugs. And while the furry fandom thrives on the wide range of creativity and different art forms; fursuiters are often the most prominent phenomenon on site. These giant fuzzy critters are bringing their anthropomorphic fantasies into the living world. Fursuiting is a whole lot of fun. However, it is also an extremely warm and exhausting thing to do. Imagine, if you will, running around in a thick whole body winter coat in the middle of summer. - Your vision is limited, your breathing is muffled and your sense of touch is greatly reduced. - It’s not the most pleasant situation to be in for a long period of time. This said, fursuiters brave these harsh conditions to bring smiles to people, entertain and have fun. Here is where the Fursuit-Support-Team comes in. We love to see these critters around as much as possible. And the better we take care of their needs and wellbeing, the more often we get to see them performing. The work we do is unseen by most attendees, but we are there when fursuiters hide from the public eye to break character to recover. We get paid in hugs and thank yous from people who can fursuit twice as long now rather than dying of heatstroke or dehydration. Seeing that Eurofurence is praised for its fursuit friendly services and having one of the highest fursuiter quotas of all conventions fills us with great pride. So what does the Fursuit-Team actually do? By far our biggest job at the convention is running the “Fursuit Lounge”. A 1000m² hall filled with cooling blower arrays, self-constructed costume drying systems, a fursuit repair center, dozens of drink supply stations and lots of storage space. Once set up, we constantly have to keep all this clean, stocked, and looked after. We are, of course, always there to lend a helping hand, answer questions, check on people’s health, and ensure a fursuiter’s ‘character-privacy’ is respected. We also provide these services to panels and events. If a panel or dance involves fursuiters, then we ensure there are wind machines and a backstage area with water and snacks for them. Fursuiters also get their own convention badges that need to be produced and handed out by a whole team of dedicated volunteers. Many of our tasks may seem menial, such as refilling water, cleaning areas, carrying things around etc. But even these small tasks can mean the world to an exhausted fursuiter who needs nothing more than some fresh air and water. - And lastly, fursuiters need us the most when they are out having fun and exhausting themselves. We are at our busiest during these times and will need all the help we can get often late into the night to cover the fursuit dances.